Santiago de Chile Daily Photo: Healthy fast food! People is realizing that fast food is not the healthier option. As I commented in parisdailyphoto a couple of days ago, here in Chile we are seeing a lot of new "healthy fast food" options. 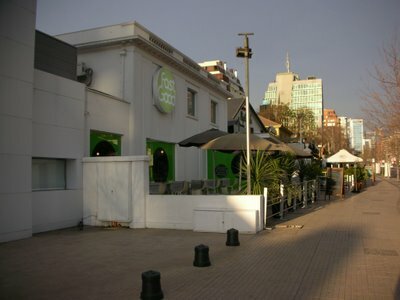 This picture shows Fast Good, a branch of a well known Spanish restaurant which installed its first international branch in Santiago de Chile. The restaurant has a very modern decoration and the food (sandwiches, soups, salads and pasta) are really tasty. Even french fries are better than McDonald's! Nice. Anything's better than McDonald's. I love the light in this shot...and the way that hi-rise glows...something so peaceful about it...maybe it's because no one's around! :-) It looks like early morn or right before sunset to me--great picture! Nice Shot! The shadow is wonderful!